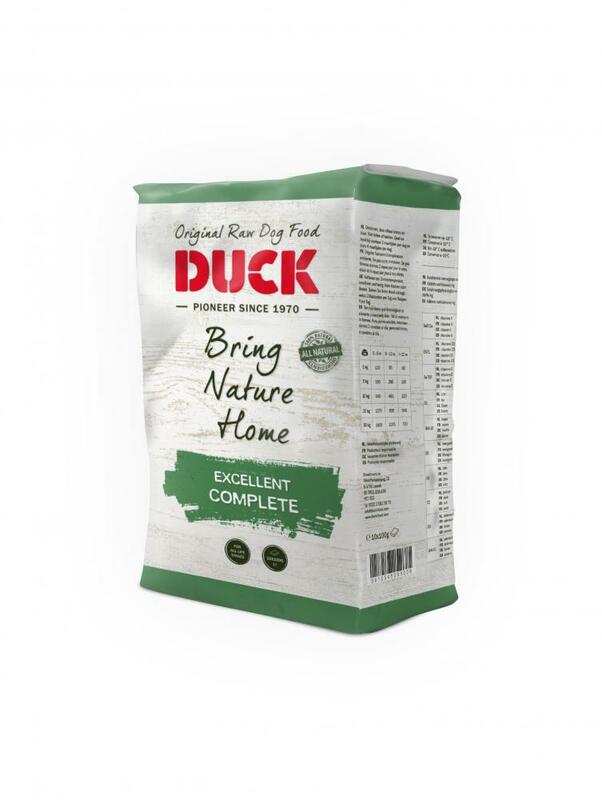 DUCK tries to imitate nature as closely as possible in developing a complete deep-frozen meal for dogs. 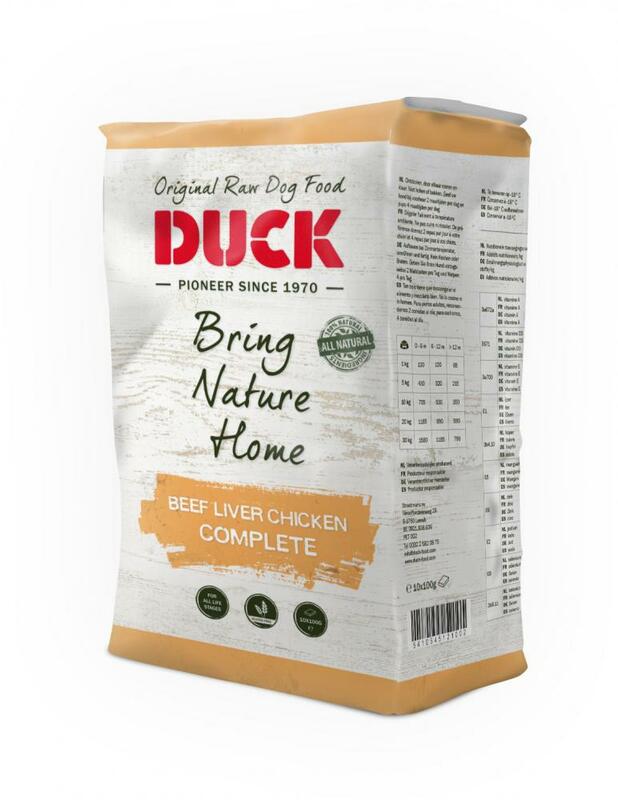 Our natural food is suitable for pups, adult dogs, old dogs and working dogs. In traditional commercial foods, there are different types of food for different age categories, another type of food for active dogs, plus light meals and supplemented kibbles. This is crazy , because in nature our dog's ancestor, the wolf, did not have the choice between high protein deer, light boar or rabbits for puppies. And still, the answer is provided by nature, Not in the kind of food- we know that the food is the total prey - but in feeding behaviour. Until they are 4 months old, pups have priority when feeding. They can eat first, simply because they need more food. Not different food, more food! An old dog, or overweight dog does not need different food, but simply less! This is only valid for natural food and not for dry, canned or otherwise. It's a question of quality and discipline. DUCK increase your dog's resistance and gives it renewed energy and life force. Duck Complete is whole food. You don't have to add anything. One of the main requirements of food is that your dog likes it. You will see that your dog is mad about the small and taste of DUCK Complete. Indeed, the smell and taste of fresh meat are irreplaceable. DUCK Complete is user friendly. Our one kilo packs are divided into easy 100 gram portions. This enables you to take out the right amount very easily. DUCK Complete suits every dog. Small and big, young and old can eat the same. 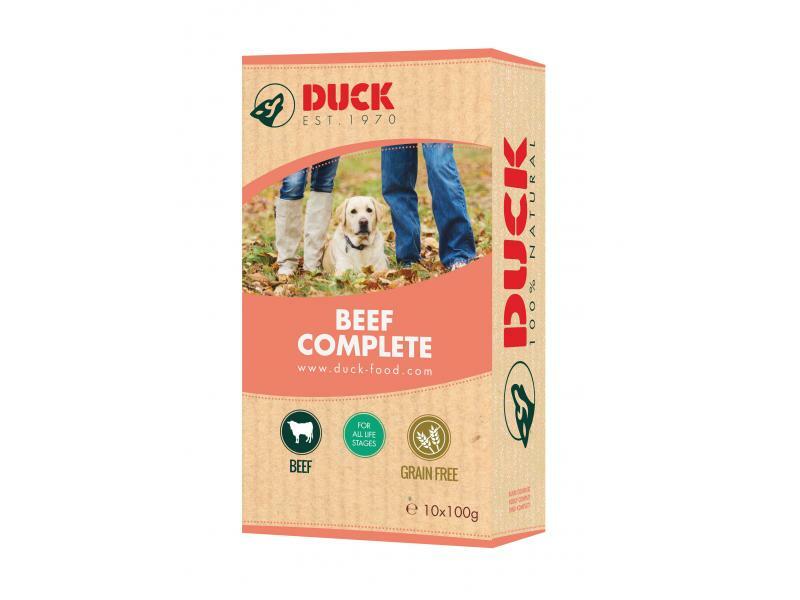 DUCK Complete does contain beef, lamb, poultry and meat that have been approved for human consumption.DUCK contains a blend of meat, offal, cartilage and cereal. 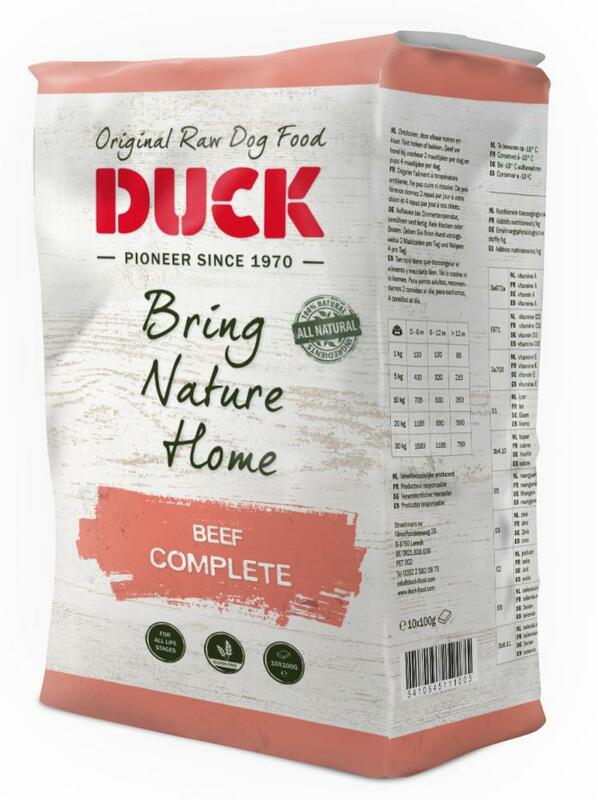 DUCK Complete does not contain any preservatives, colouring agents or taste enhancers. In traditional commercial food, these products are responsible for stomach and intestine problems, allergies, skin problems and behavioural problems. 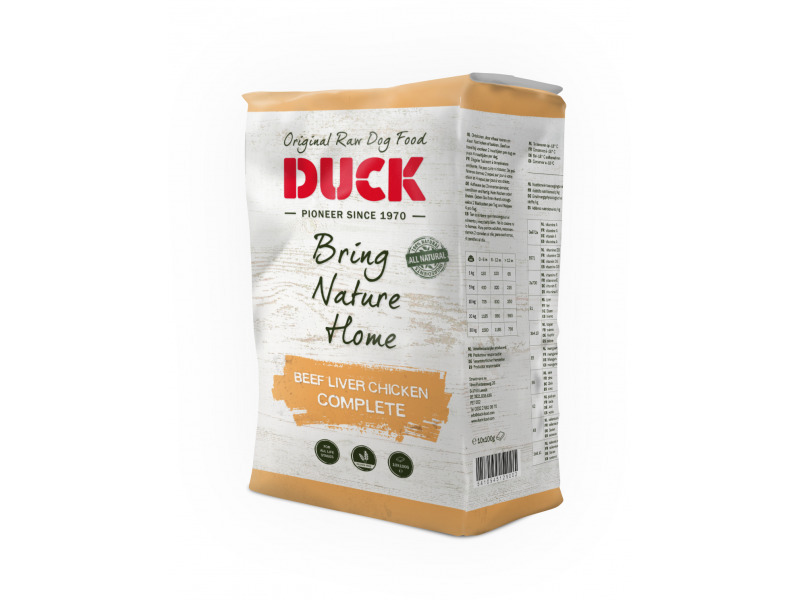 DUCK contains natural meat juices. As a result your dog does not need to drink litres of water every day and the risk of gastric torsion is reduced. All ingredients are processed without being heated first, except cereals, which are first germinated. This is a huge advantage, because when raw materials are heated, enzymes are killed, vitamins are neutralised and fat is saturated. 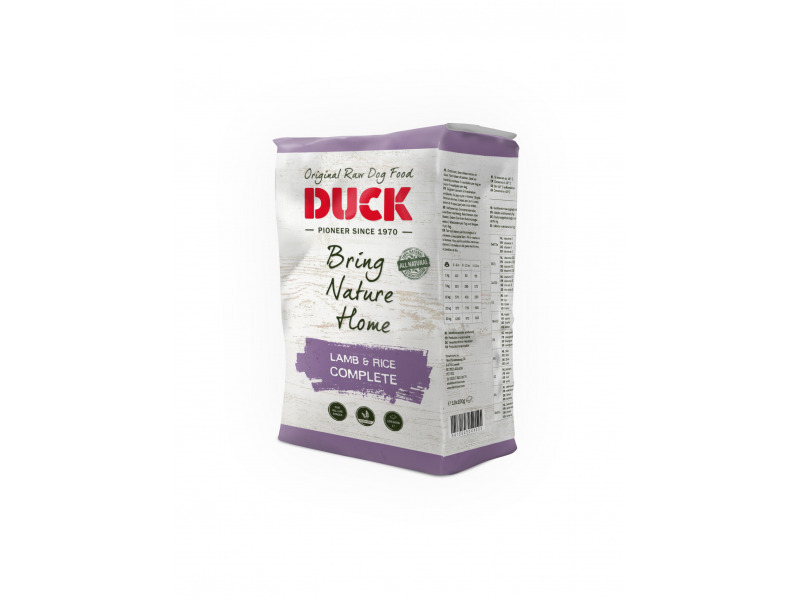 DUCK is highly digestive and thus guarantees limited compact excrements. DUCK Complete reduces the production of plaque. 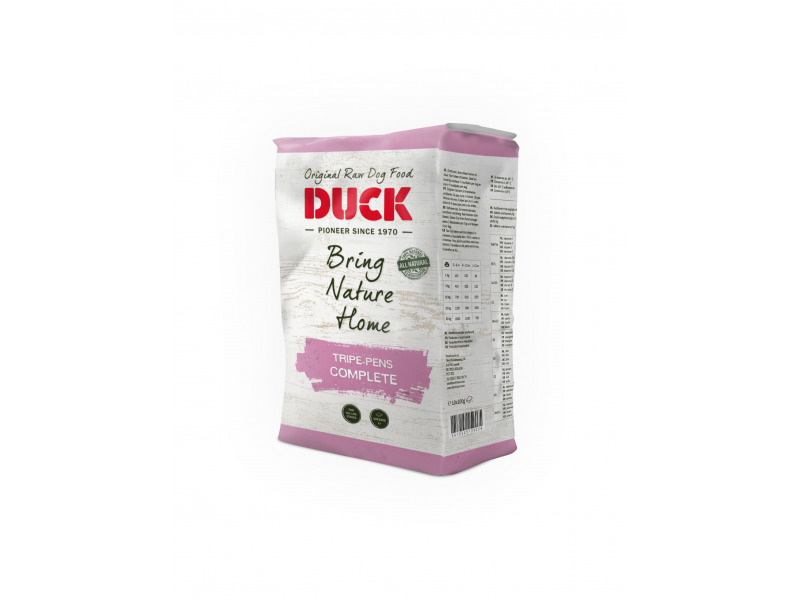 DUCK Complete reduces the risk of torsion of the stomach. Each cases contains 8 x 1Kg packets. Each Pack has 10 x 100g slices. Cases dimensions are 39cm x 13cm x 18cm. You should be able to feel your dog's ribs, but not see them. That's how you know that your dog is at its ideal weight. For a food guideline, take your dog's age, level of activity and body weight into account. Medium-sized and large dogs should be served 2% of their ideal body weight per day, spread over two meals. Small dogs can receive 3% to 5% of their ideal body weight per day, spread over two meals. The puppy of a large breed should be served 4% to 5% of their current body weight per day. Puppies of small to medium-sized breeds should be served 6% to 10% of their current body weight per day. For puppies it's best to spread the portions over 4 to 5 meals per day. You dog's nutritional needs decrease after they are 6 months old. Ask your vet about your dog's ideal body weight then calculate its nutritional needs once it is an adult. Gradually reduce the portions so that you reach an adult portion within 6 months. Spread the portion over 3 meals per day. There are currently no questions for DUCK Complete - be the first to ask one!